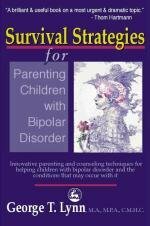 Item Nr: B 95125 Title: Survival Strategies for Parenting Children with Bipolar Disorder: Innovative Parenting and Counseling Techniques for Helping Children with Bipolar Disorder and the Conditions that May Occur with It. Offers practical advice on recognizing the symptoms, understanding medication and accessing the necessary support at school as well as managing the day-to-day challenges of parenting a child with bipolar disorder. As it is frequently found in combination with ADHD, Tourette Syndrome and Asperger's syndrome, the author draws on case-studies from his own psychotherapeutic practice to show what these conditions have in common, how they differ, and how they are related to each other. It emphasises the positive qualities these children often have and illustrates how their gifts and abilities can build their self-esteem and help them function better in society.